Professional quality ball gloves made to the same demanding Elite Series standards but to your specifications. Steerhide, deer tanned linings, and Dura-Pro Felt padding. There are sixteen professional and two youth patterns to choose from. You can choose your gloves size, web design, back style, and leather type. 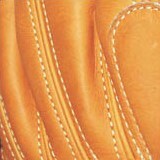 Also, you choose leather color, welt, lace, and index finger pad. Finally, you get your name embroidered on the back of the thumb. So what is the main difference between the Custom Select and Elite? Glovesmith Custom Elite - are produced in more limited quantities and each is number and registered. Each Custom Elite is bend cut: the shell, the lining, and the lacing are cut just below the backbone section of the hide which is usually the thickest, cleanest, and has the most consistent fiber structure of a hide. By contrast most every glove on the market only uses the bend area for the palm of the glove. The Custom Elite gloves are stuffed with our Dura-Pro padding which is the firmest padding we offer. Finally the Custom Elite's come with metallic gold labels. of all leather in a given hide. glove to assist with break-in. Each welted back seam is sewn three times for shape retention. Each Custom Elite is adorned with our unique metallic gold labels.